Campers can spend time sailing or kayaking in Copano Bay, home to a diverse ecosystem of native birds like the whooping crane, finfish including red drum, black drum, flounder and trout, as well as shellfish such as oysters. See what types of plants and animals are living in the wetlands from your perch on the accessible Viewing Platform. Stocked with fish who like to be caught, kissed and released! Don’t forget to make a wish as you toss your fish back in the pond. Practice your paddling skills in this shallow, inland lake. We offer kayaking, canoeing and paddle boarding. Campers can experience this unique ecosystem and learn how wetlands provide food and habitat for native wildlife. Best place for campfire, s’mores and singing in all of Aransas County. 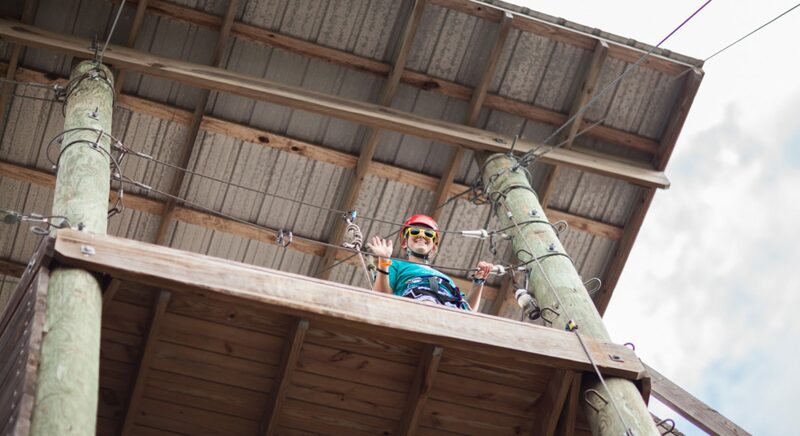 Campers of all abilities can climb, zip and test their limits on the Challenge Course, all while having the power to choose their challenge. Are you brave enough to try the Screamer? This giant swing produces just as many laughs as it does screams. You can choose how high you go. During the summer, meet our critters, including snakes, guinea pigs, mice and hedgehogs. Also learn about South Texas flora and fauna. Accessible Boardwalks allow campers to glide above the wetlands and explore nature up close. Built by student volunteers from UT’s Gulf Coast DesignLab, the Bird Blind allows excellent views of native birds, wetlands and tidal pools. Enjoy the coastal breezes under this all-purpose covered area for games, skits, basketball, hockey and more. Look for the Camp Aranzazu logo in the air off of Loop 1781. This massive, accessible bridge takes campers across Loop 1781 to our 27 acres of waterfront and wetlands to discover Copano Bay. The 10,000 square-foot Welcome Center and Dining Hall includes the Whataburger/Dobson Family Kitchen, as well as staff offices. This cabin is used primarily to house summer staff. Perfect shady spot on Copano Bay utilized for waterfront programming and environmental education. Our accessible archery range is a perfect place for campers to master new skills and practice their aim. Visit the homey Health Center to take medicine and receive treatments while at camp. Two bedrooms are available for medical staff (five beds total). Equipped with nurse’s station and treatment rooms. See the custom-designed stained glass windows depicting Our Lady of Aranzazu. This air-conditioned area can be used for ceremonies, yoga, reflection and more. Our new Party Pool has a maximum depth of four feet making it the perfect place to can enjoy the cooled water and hang out with friends. Park here for easy cabin access. Enjoy dips in our accessible classic pool with shallow and deep ends. Bird’s Nest and High Tide look similar. Can you spot the difference? This four-room cabin also holds up to 52 campers, has en suite restrooms and air conditioning. Spend some time getting to know your creative side in the Sarofim Creative Arts Center, with a variety of fine arts programs developed in conjunction with artists from the Rockport Center for the Arts. We also have a kitchen for cooking classes. Park here and check in at the Welcome Center if you are just visiting or arriving for camp. High Tide is our newest cabin, named after local aquatic life. This four-room cabin holds up to 52 campers, has en suite restrooms and air conditioning. This two-room cabin holds up to 26 campers, has en suite restrooms and air conditioning. These rooms are named after local wildflowers.